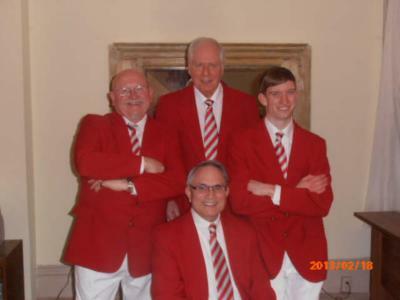 The Olde Thyme Harmony Quartet formed in December 2009 when they registered with the Barbershop Harmony Society. You could think of this quartet as the "Generation Gap Quartet" as they range in age from 29 years old to 79 years old. Perhaps, you may think of them as the "Pitch-Pipeless Four" as the Tenor has Perfect Pitch and there is no need for a Pitch Pipe for tuning. Although new as a foursome, they have many years of quartet experience. 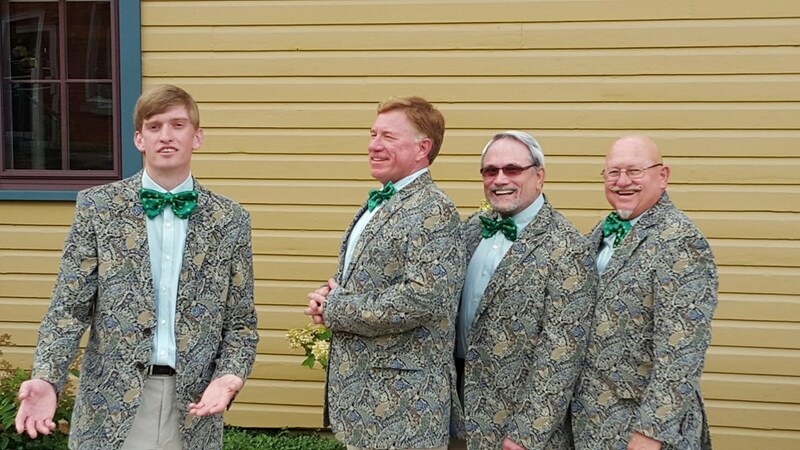 Olde Thyme Harmony Quartet is a Hard Working quartet with the motivation to provide your event with the best Harmony in the house on any given night. All are members Lansing (MI) Chapter of the Barbershop Harmony Society. The quartet is BIG on Coaching and Competition to continue to improve on their quality of singing and their performance package. Their repertoire presently includes over 30 songs including, Barbershop Standards, Love Ballads and Up tunes as well as, Classic's, Irish songs and Show tunes. They have become a VERY entertaining quartet and the demand keeps growing. OTHQ has been Finalists in several recent Pioneer Dist. contest and placed 2rd in the Annual Bush League contest in Gaylord MI in 2014. Olde Thyme Harmony Quartet has performed over the Mid-West including, Michigan, Ohio, Pennsylvania, New York, Wisconsin and Illinois. Singing BASS is Don Horton, the olde timer in the group having been a Society member for 50 years. Don sings BASS, LEAD & BARITONE and has sung in many quartets over the past 50 years. He is a Real Estate Broker and Appraiser and lives with his wife Sandy (of 59 plus years). Don's Love for Barbershopping began in a college quartet at Ferris State University (Ferris Institute in 1957). Don is the major spokesman for the quartet but is often backed up by surprises from other quartet members. Spontaneous Interplay can be VERY entertaining. Singing LEAD, & BARI is Paul Nolte the newest member having joined the quartet in July of 2017. Paul says, I sang in a high school quartet and is a 28 year member of the Barbershop Harmony Society. He also sings with Memory Lane and Bluetonium quartets. He also performs single as a ONE MAN BAND called NOSTALGIA Broadcasting Company (live Music & Comedy). Paul will add some interesting Fun Variety to our performances. Singing BARITONE and occasional LEAD is Dr. Tim Oliver. Tim has been a member of the Society and the Lansing Chapter for the past 15 years. He and Don sang together in the Sufficient Grounds quartet for 8 years. 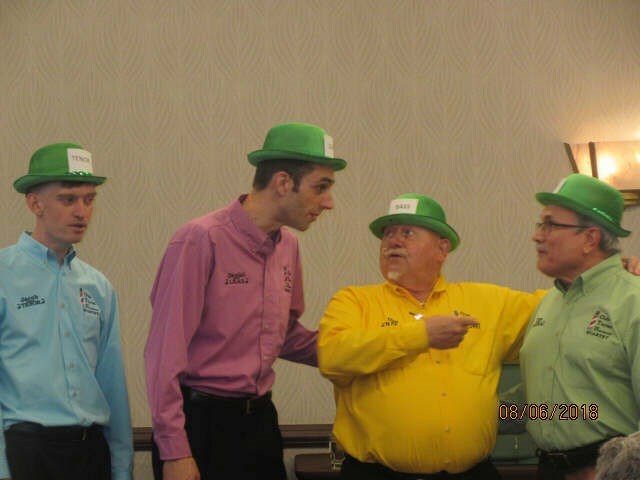 They also sang together in the District Senior's Championship Quartet "Weekend Agenda" prior to teaming up in the Olde Thyme Harmony Quartet and switching parts. Tim is a former member of the MSU, Spartan Marching Band. GO GREEN!! He received his medical degree from Wayne State University and completed residency in Family Practice in Saginaw. He is a member of the medical staff at Memorial Healthcare Center. He and his wife Marcia reside in Owosso. Tim's Love for Barbershopping began when he sang LEAD in a quartet in the fabulous MUSIC MAN performance by the Owosso Community Players about 17 years ago. Olde Thyme Harmony Quartet has been entertaining for all venues over the Midwest having performed all over Michigan and in Wisconsin, Ohio, Ontario Canada and Rochester NY. The quartet is proud of their consistent 5 Star Ratings with Gigmaster's and have performed on many Barbershop Chapter Shows, Corporate Events, Holiday Parties, House Parties, Sales Promotions, Weddings and would be happy to entertain you at your next venue. Working with Don was a pleasure and he bent over backwards to help me celebrate my parents anniversary in a way that delighted everyone. The OTHQ gave a wonderful performance at our church. We had a large number of attendees (110 compared with the average of 90-95) and many of them let me know how much they enjoyed the music and the overall performance. They encouraged me to get the Quartet back for a future concert, and I'm happy to do so. Don and the other members of OTHQ were delightful and I enjoyed hosting them. I would highly recommend them to anyone wanting an excellent barbershop quartet to perform at an event. They were amazing and entertained every age from 2 to 97 years old. It was a Wonderful day! These gentlemen are the real deal!! They really know how to harmonize and perform! I booked them forth cocktail hour portion of my 1920s themed wedding. They accommodated both the theme and my wedding colors perfectly! My Husband's grandma made two song requests and they knew both of them and serenaded her. They also prepared a few songs specially for the me and the groom. Their voices along with the songs they singed moved me to tears- really!! Excellent performance and professionalism. Highly recommend! The OTHQ were great communicators before the event, during the event and after. Their performance was perfect for our event and had something for all ages. My Mom was surprised, and loved the show! We had OTHQ perform at our Christmas Party, and they were SUPERB!!! The party took place at Chelsea Retirement Community, and OTHQ were truly the delight of the evening. There performances were excellent, and they also interacted with guests and led a sing along. Truly a pleasure having them perform. They go above and beyond to make guests feel included and happy, and exceeded our expectations. We will definitely be having them at future events! Thank you!!! Quartet was hired as a surprise for my parents 60th Anniversary. They were entertaining, talented, friendly, on time, and made my parents day all that much more special. All of the coordinating was done from out of state and was easy and effortless to do. They were easy to get in touch with and quick to respond. I would highly recommend them to anyone looking to be entertained with some wonderful singing and showmanship. Two thumbs up, way up...for the wonderful memories my parents will treasure for a very long time. Great bunch of guys. Very accommodating and considerate. Great performance. Would hire again. As the show chairman, they made it very easy on me. No strong demands, and the performance went very smoothly. Please note Olde Thyme Harmony Quartet will also travel to Corunna, Henderson, Vernon, Oakley, Ovid, Bancroft, Durand, Laingsburg, Lennon, Morrice, New Lothrop, Chesaning, Elsie, Perry, Shaftsburg, Bannister, Byron, Brant, Eagle, Eureka, Flint, Flushing, Gaines, Swartz Creek, Ashley, Bath, Montrose, Saint Johns, Cohoctah, Haslett.